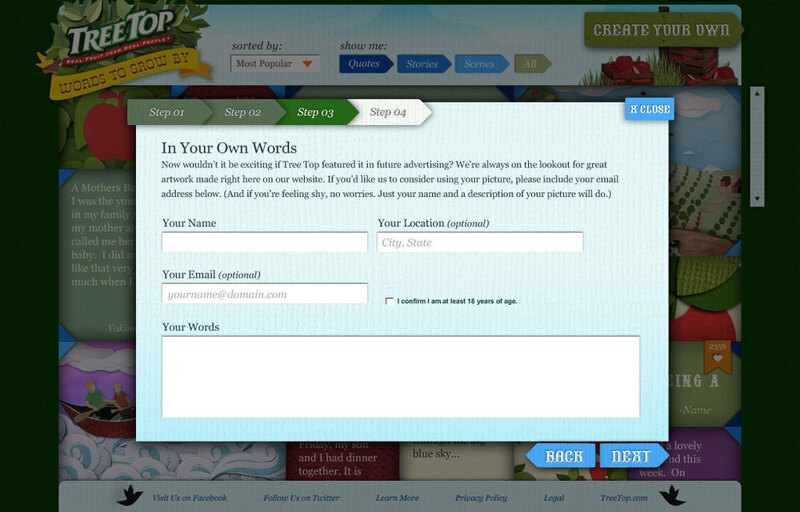 The Tree Top Words To Grow By microsite brings the appealing, commonsense philosophies of the growers to life in a fun, authentic and an inspiring way based on a time-tested tradition of storytelling: the story quilt. 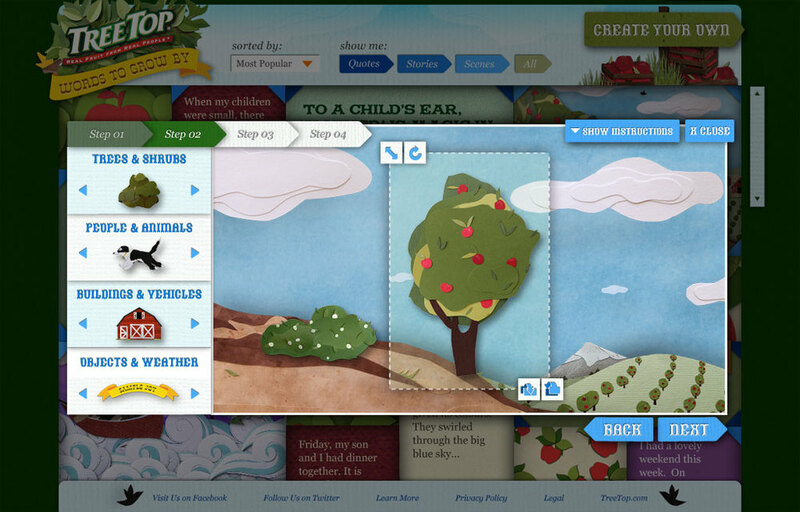 By arranging whimsical, handmade visual elements into their own customized scenes, the site allows the growers and employees to tell their story of Tree Top through imagery. 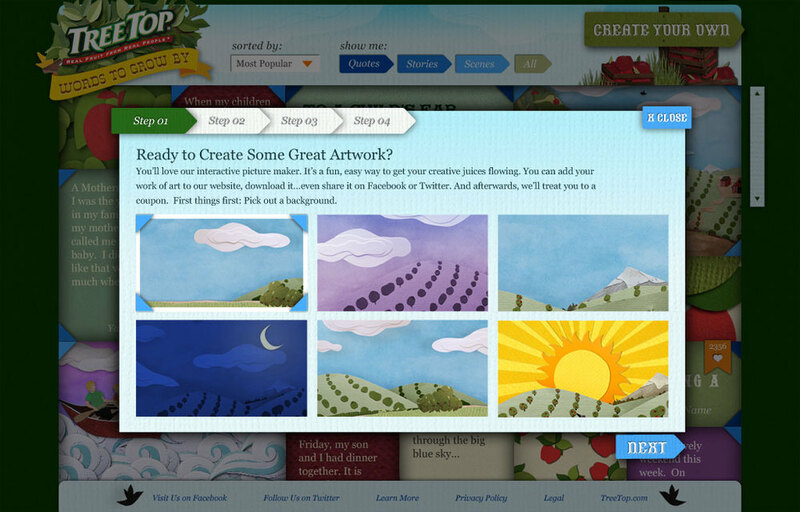 The scenes they create are ‘woven’ together into an ever-expanding digital quilt. Peppered throughout the imagery created by Tree Top’s growers, panels containing text describing the history and philosophies of the growers can be found, further reinforcing the story of Tree Top and it’s focus on the ‘good life’ for it’s family and providing inspiration for creating it in yours. 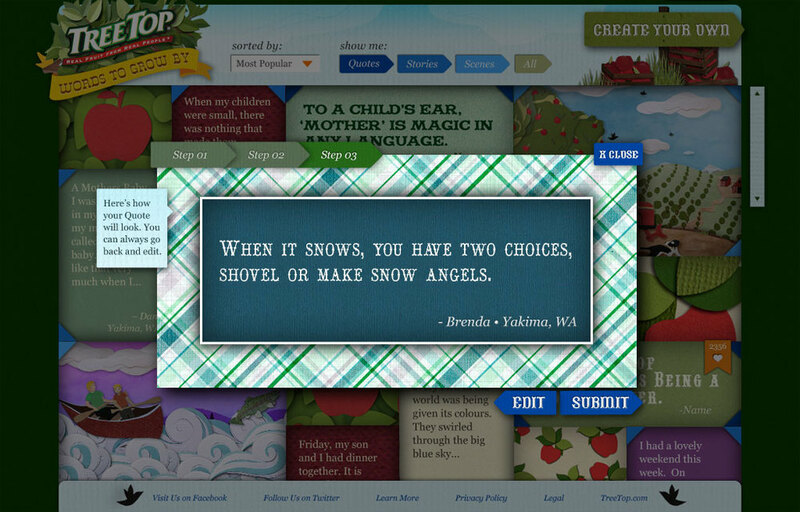 A visitor to the Words to Grow By microsite is prompted to add their own story to the quilt with the same visual elements used by the growers and employees of Tree Top via a simple, intuitive drag and drop interface. Additionally, visitors are encouraged to offer their own inspiration in the form of short quotes or advice, brought to life through bold type over patterns or colors created in the same hand made visual style. As the quilt continues to grow, a new story is written: the story of the brand and it’s customers, friends, and family. We were able to bring the story of Tree Top to life through paper elements created by artist/3d illustrator Jayme McGowan. 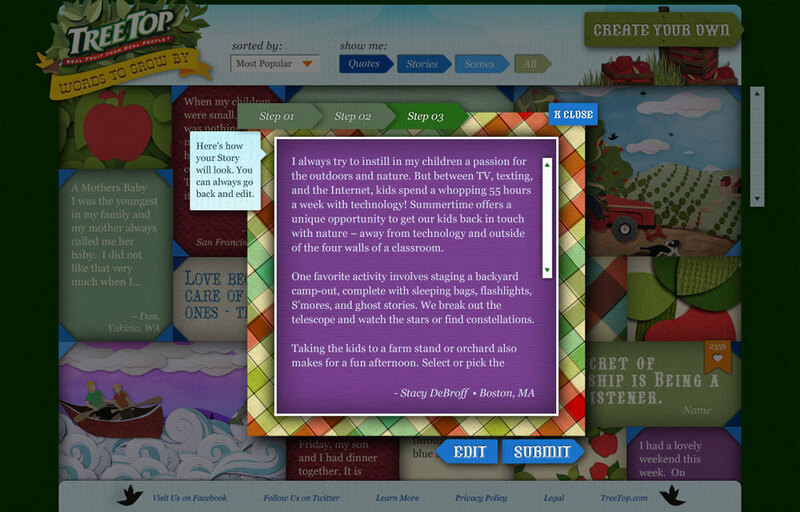 Over one hundred and eighty unique elements allow a site visitor to create a scene depicting thier story and add it to the digital quilt, where visitors are encouraged to ‘Favorite’ a scene, post it to their Facebook page, or share it with friends via email or Twitter. 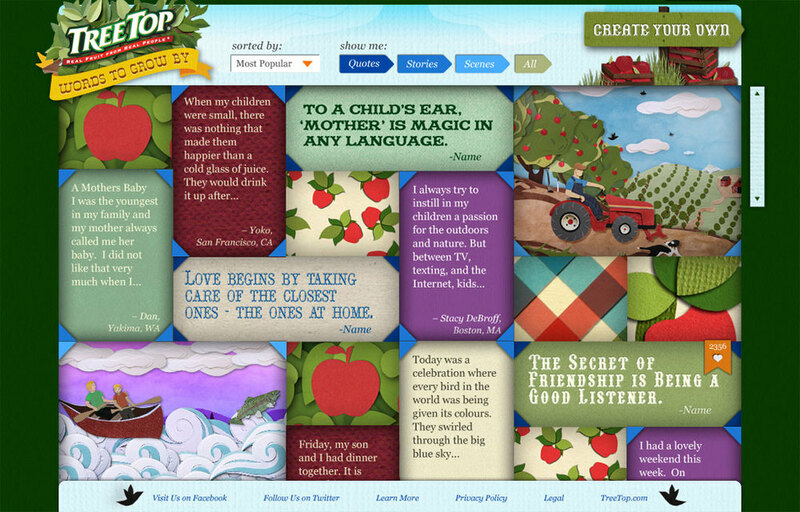 In addition to scenes, a visitor can share an inspirational quote or story and add it to the quilt. In addition to the microsite, we created a :15 second spot, which ran as a bumper across digital video destinations like Hulu as well as shared through YouTube and the Facebook community.